Are all of these terms as confusing to you as they are to me? You’re not alone. These wonderful desserts utilizing fresh fruit have been around for centuries and in our rush to streamline every facet of our lives, they are largely being forgotten. I grew up eating some wonderful, wholesome desserts. Apple crisp, bread pudding and blueberry upside down cake were staples of my childhood. And I had no weight problem in those days. Let’s face it, in our efforts to process foods we lose sight of the fact that cooking from scratch is pretty easy. Almost every high school student I ask prefers Kraft mac and cheese to homemade. What? Are you serious? Nowhere in my Crayola box of 64 did the unnatural shade of orange that characterizes processed cheese products exist. Back to dessert. In the Northeast summer is the time of fresh fruits and vegetables. At this time of the year we have plenty of blueberries, raspberries, peaches and plums. Apple season is just around the corner. 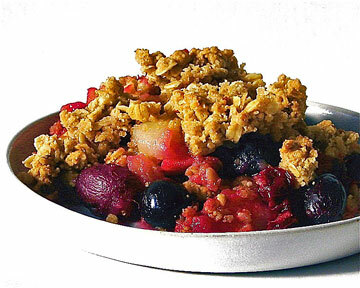 Cut up some fruit and add a crumb topping and you have a crisp or a crumble. If you combine layers of crumb topping and fruit then you have a betty or a buckle. 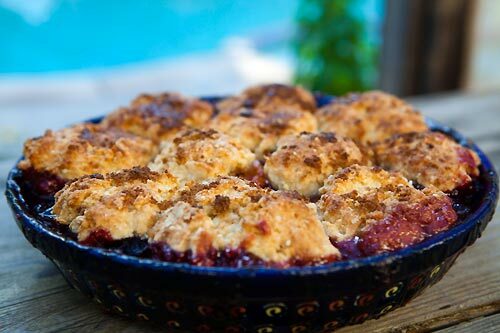 Get a panful of syrupy fruit and add biscuit dough on top; voila, you have a cobbler. Whatever you do, try to bake a dessert from scratch. You’ll be surprised how easy it is to do and how far superior it tastes to anything you buy that’s premade. Let the past educate us. These foods are healthier for us and contain fresh ingredients. Dessert eating can be fairly healthy. We just need to retain lessons from the past. This entry was posted in summer, the Northeast and tagged cooking, desserts, fruit, healthy. Bookmark the permalink. Kraft Mac & Cheese is delish…but I do prefer homemade. There’s something about the ‘cheese flavour’ that makes me a little disgruntled to consume the stuff.